1.47 billion people watch Men's EHF European Championship in Serbia. The European Handball Federation (EHF) and its partner Infront Sports & Media have announced new record levels of television coverage for the Men’s EHF EURO 2012 held in Serbia from 15 to 29 January 2012. A cumulative television audience of 1.47 billion people enjoyed European handball at its best, transmitted by 75 licensed broadcasters into more than 200 countries and territories. This is a 40 percent increase compared to the 1.03 billion achieved in 2010, when the biennial event was last held in Austria, and a 20 percent increase compared to the previous all-time record from Norway in 2008 (cumulative audience of 1.22 billion). An upward trend was also registered in regards to broadcast time with 1,898 hours, compared to 1,700 in 2010. The Men’s EHF EURO is the flagship national team event of the European Handball Federation (EHF) and has experienced continuous growth since its inception in 1993. This year, a record of over 300,000 spectators came to watch the games in the five playing venues - a considerable increase on the 280,000, who watched the previous event in Austria in 2010. There has also been a significant increase in demand for online information from the event, the teams and the partners involved. One million unique users visited the official website, www.ehf-euro.com, and the number of visits was almost three times higher than in 2010 (2.45 million compared to 900,000), with page views also doubling from 4.61 million to 9.99 million. 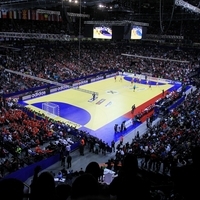 Additionally, over 35,000 fans 'liked' the official Facebook Page, whilst 860,000 videos – including live match streams with full commentary and video reports – were viewed on the event’s official YouTube Channel at youtube.com/ehfeuro. The superb TV results this year are a result of a number of enhancements initiated by the EHF and Infront in their attempt to constantly strengthen the appeal of the tournament and its global reach. For the first time ever, the Men’s EHF EURO 2012 was fully produced in High Definition (HD) quality, enabling broadcasters to transmit even sharper clear-cut images that truly captured the handball action in all its glory for the audiences. Secondly, Infront managed to close agreements in regions where European handball has been absent from TV screens for a while – for example in several Pan-Asian territories. The event format with the longer playing schedule contributed to this television appeal, whilst the success of the home nation was a further driving force towards media coverage success. The impressive reach is not only highly beneficial to the sport and its fans, but also to the Official Sponsors of the Men’s EHF EURO, including AJ (office, warehouse and materials handling products supplier), Bauhaus (workshop, house and garden products retailer), Grundfos (pumps and water application systems for industry manufacturer), Raiffeisen Bank (banking group), Intersport (sporting goods retailer), bet-at-home.com (online gaming and sports betting company) and Guide (working clothes). * Results are based on an independent programme analysis compiled by Sport+Markt on behalf of Infront as well as information provided by broadcast partners.